It’s that time of year, when we start to eat fruit salads and popsicles here in Southern California! 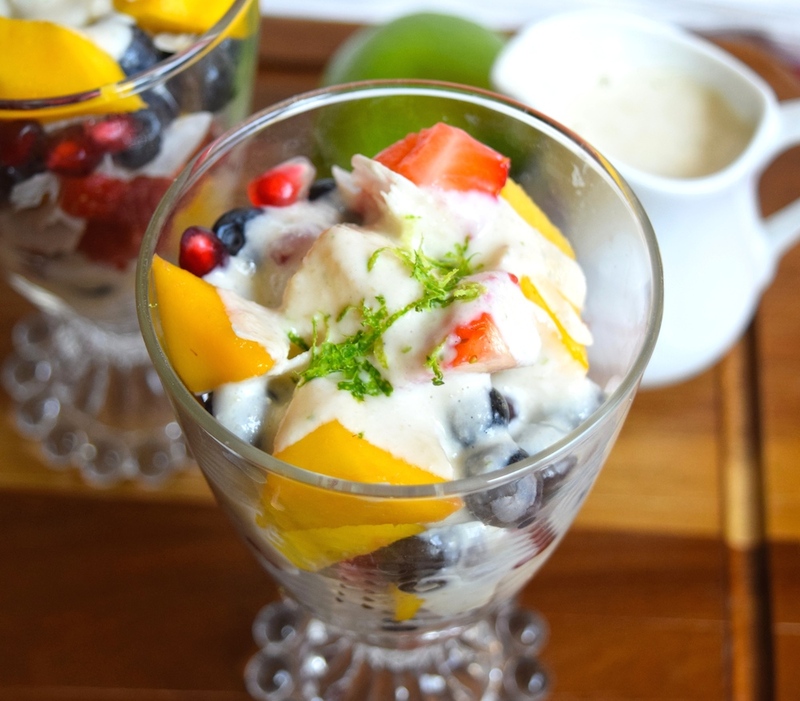 This recipe for Fruit Salad with Vegan Lime Sauce is a refreshing, delicious dish that fits everything from potlucks, to Easter, to a simple after school snack. It looks fancy, but is actually quite easy to make. 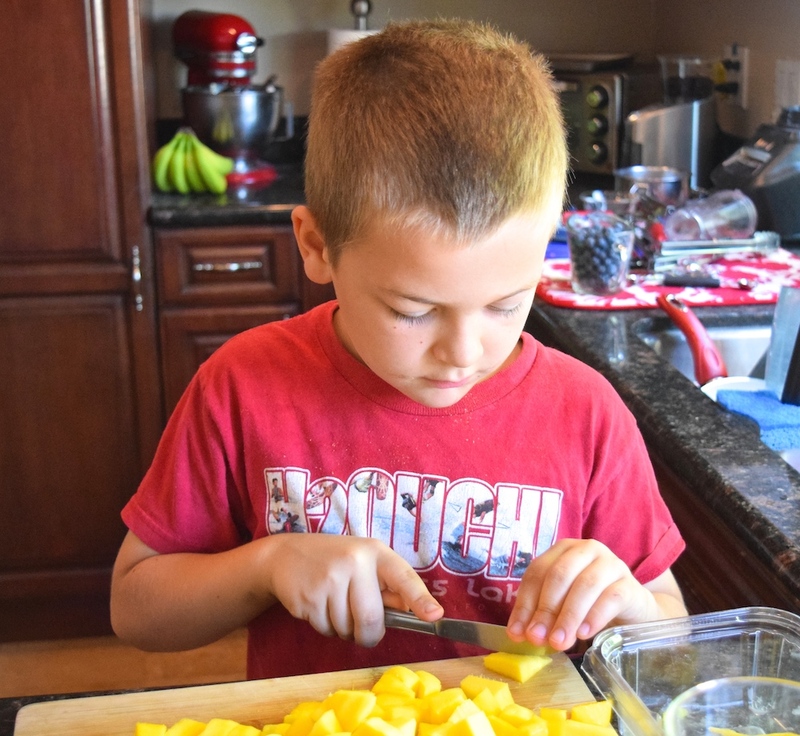 Caleb was my little helper, using a blunt knife to cut the skinned mango pieces into smaller chunks. I’ve said this before, but can’t emphasize enough how important it is to let your kids help prepare healthy food in the kitchen! It helps them feel confident and good about their accomplishments, teaches them to enjoy healthy food, and sets up good patterns that they are likely to carry on into adulthood. Fruit salad is generally pretty high in sugar and not diabetic friendly. I’ve pulled a couple of tricks out of my hat for this recipe, though, to help you process the sugars and slow them down as they enter your blood stream. The coconut and cashews add fat, fiber, and protein, which lowers the Glycemic Index. Coconut relieves stress on your pancreas, which speeds up your metabolism and can help you lose weight. Loosing weight is a very important for diabetics, because fat cells reduce your body’s ability to move sugar into cells and use it as energy. This means you require more insulin. If you’d like to know more about coconut and how healthy it is, check out this article. One other trick you can use to make this dish diabetic friendly is to use mostly berries and pomegranate for the fruit. Berries are lower in sugar than other fruits, and they’re packed with antioxidants. Pomegranates have been shown to be beneficial for Type 2 Diabetics in some studies, by increasing insulin secretion and assisting in weight loss. They also help to raise glutathione levels, which tend to be low in people who struggle with diabetes (low glutathione levels can also cause thyroid problems…I have both). Glutathione is essential for helping your body deal with oxidative stress. For more information on pomegranates and diabetes, read this article. I used some mango, too, which is definitely high in sugar, but used mostly berries and pomegranates for my fruit salad. 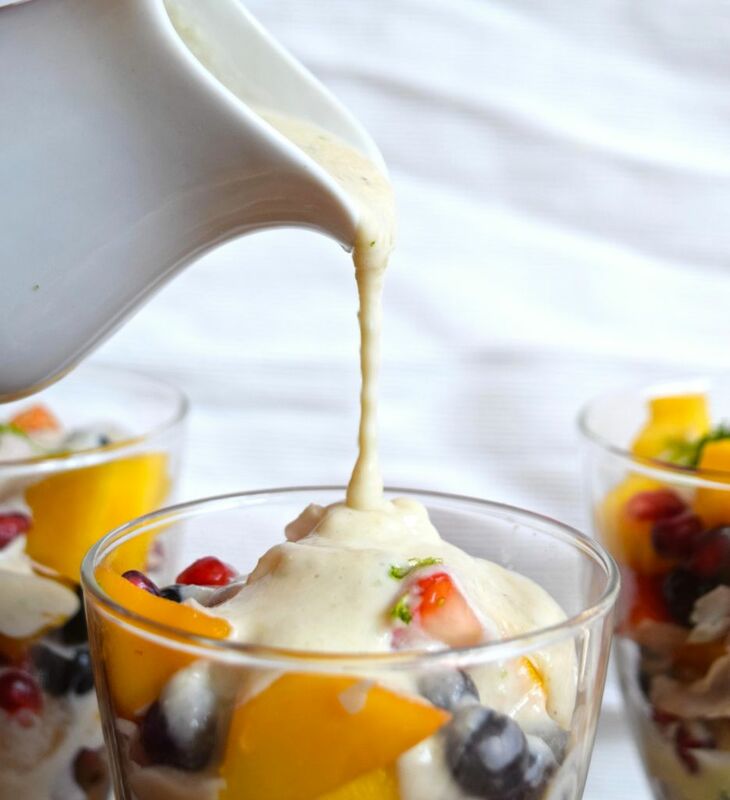 Before we get to the recipe for the Fruit Salad with Vegan Lime Sauce, I want to invite you to join with others who are making healthy changes. I’d love to walk alongside you in your journey towards wholeness and health! Jesus said, “I have come that they may have life, and have it to the full!” Freedom from food addictions is part of having a truly full life. 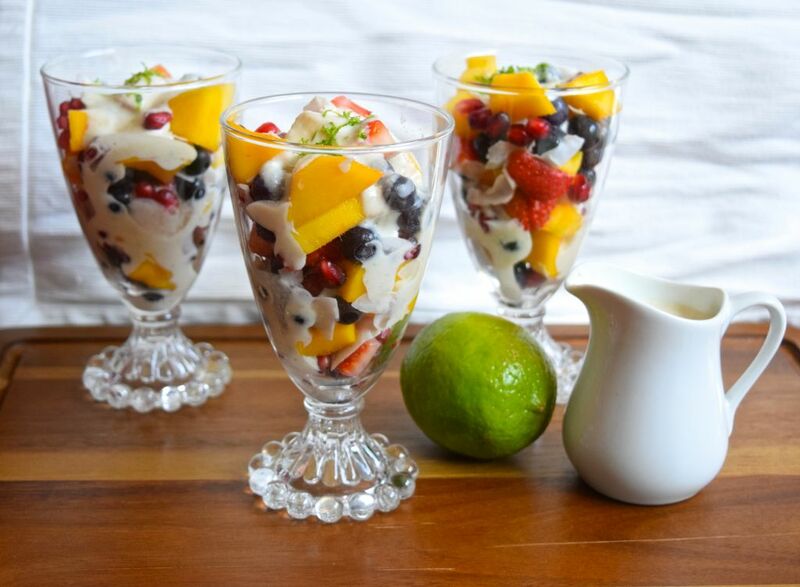 This recipe for Fruit Salad with Vegan Lime Sauce is a refreshing, delicious dish that fits everything from potlucks, to Easter, to a simple after school snack. It looks fancy, but is actually quite easy to make. 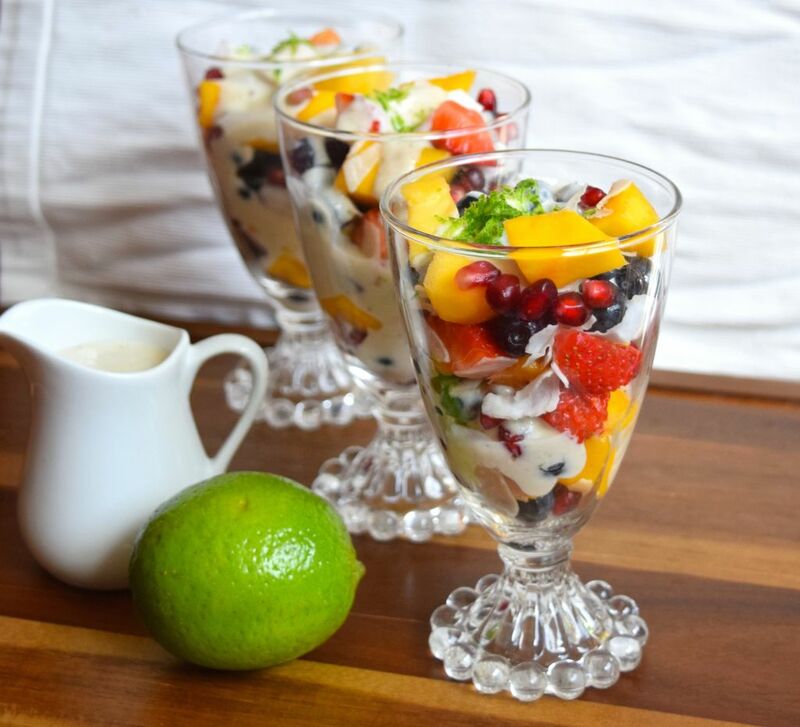 Combine the chopped fruit and flaked coconut in a large bowl. Using a microplaner to zest your lime. I used all of the zest from mine. Set the zest aside. Cut the lime in half and squeeze the juice into a small food processor. I used the single serving for my Ninja, but some handheld blenders also have a tiny food processor attachment. A full sized blender should work ok, but you may have to scrape down the sides a few times. Place half of the lime zest, and all of the remaining sauce ingredients into your blender with the lime juice. Blend it on high, until you have a smooth sauce. If you have some picky eaters, serve them the fruit without sauce. Otherwise, you have a couple of options for serving this. If you want fancy individual servings, layer the fruit and sauce in cups or bowls. If you're bringing it to a big group, stir everything together in the large bowl. Sprinkle the remaining lime zest on top. Enjoy! 9 Responses to "Fruit Salad with Vegan Lime Sauce"
Wonderful. I tried this. Thank you. Oh Girl, this remind me of my old college days. There was a time we were so obsess with mixing-fruit. I think soon enough we’ll have to call out for a reunion.